Hereditary Grand Duke Jean of Luxembourg and Princess Josephine Charlotte of Belgium were married earlier today in Luxembourg's cathedral, reports the New York Times. Prince Jean, 32, is the eldest son and heir of Grand Duchess Charlotte and her husband, Prince Felix. The 25-year-old Princess Josephine Charlotte is the eldest child of King Leopold III of the Belgians and his late wife, Princess Astrid of Sweden. 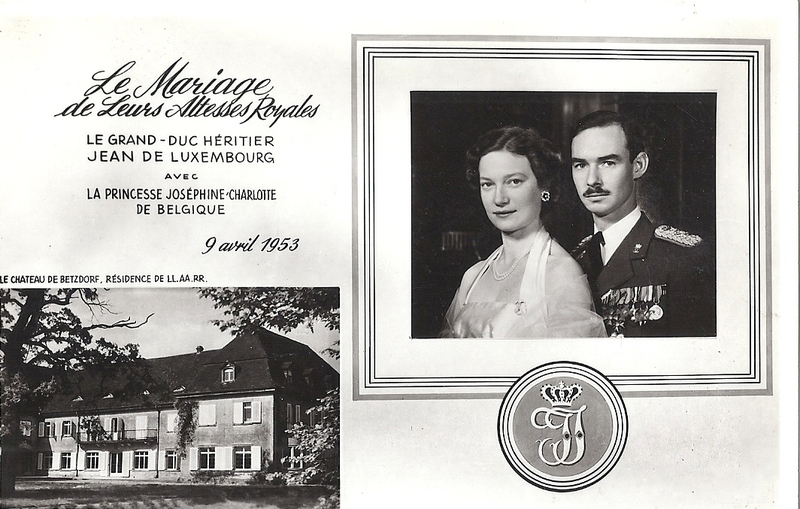 The civil wedding took place in the Hall of Ceremonies in the Grand Ducal palace. 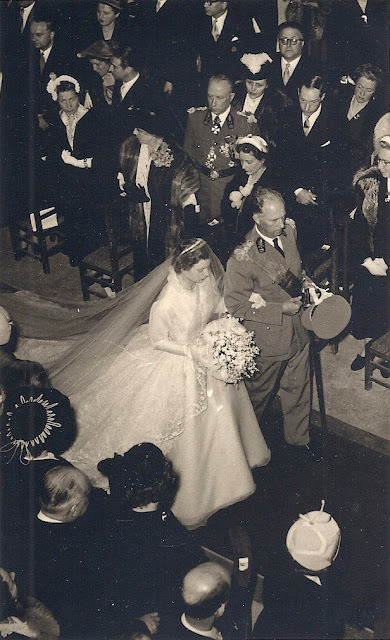 Two reigning sovereigns, King Baudouin of the Belgians, the bride's brother, and Queen Juliana of the Netherlands, were among the guests that included one former king, two former queens, twenty-two princes, eighteen princesses, one archduke, one duchess, one duke, four countesses and three counts. The royal houses of Denmark, Norway and Sweden, were "well presented." Princess Margaret of Great Britain had to send her regrets as the British royal family "is in mourning for Dowager Queen Mary." The British Minister to Luxembourg represented the Queen in Margaret's place. Princess Josephine Charlotte wore a gown of "organza,a light, natural white silk in two layers, with white tulle between." 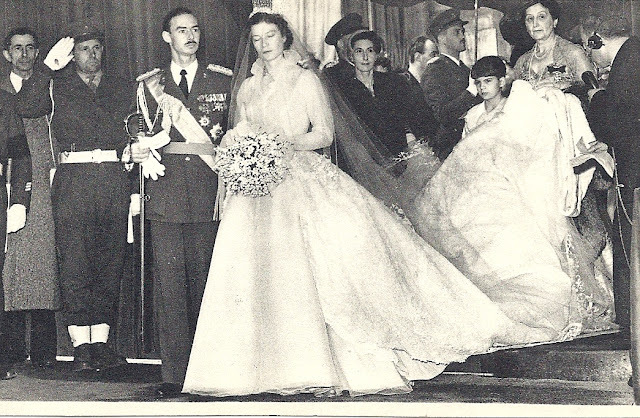 The gown featured "pleated flounces" at the neck and the V-shaped décolleté"
The bridal train "of hand0made needle-point and pillow lace, with flower motifs on an organza backing." The train was fourteen feet long and "almost as wide." Her veil was made of tulle, "lined with hand-made lace and attached by a platinum diadem studded with 855 diamonds." 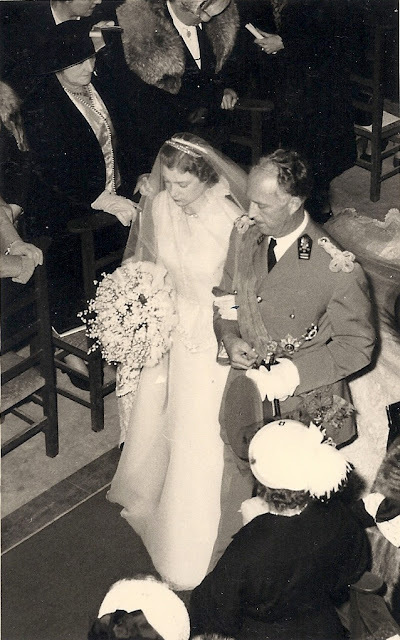 She was escorted down the aisle by her father, King Leopold. The train was held by the bride's 10 1/2 year old half brother, Prince Alexander, son of King Leopold and his second wife, Princess Liliane de Rethy. More than 2500 guests witnessed the Roman Catholic ceremony in the 16th century cathedral. The newly weds and their guests traveled in open cards back to the palace -- a one mile drive. A crowd estimated at 135,000 -- 100,000 came from Belgium -- lined the streets and "enthusiastically cheered," waving Belgian and Luxembourg flags. 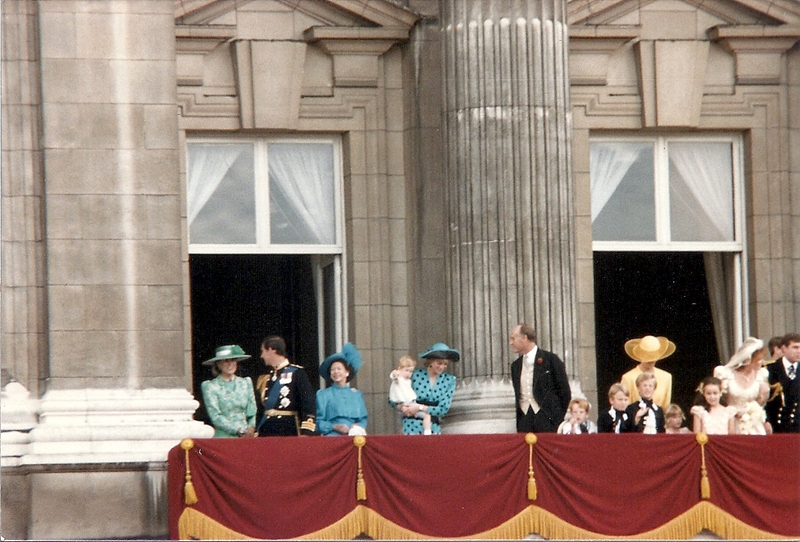 The crowds cheered all afternoon, and the newlyweds "had to appear on the balcony again and again." The wedding reception, which was held at the Grand Ducal Palace, was attended by 750 guests. The wedding was "almost postponed at the last minute" because of Princess Josephine Charlotte's nerves. She "nearly fainted three times," and Prince Jean had to "whistle for his tardy limousine." The floodlights in the cathedral may have been the reason for Princess Josephine Charlotte's nerves. After kneeling, she had to be helped up by Prince Jean. A second time, she was assisted by one of the priests. 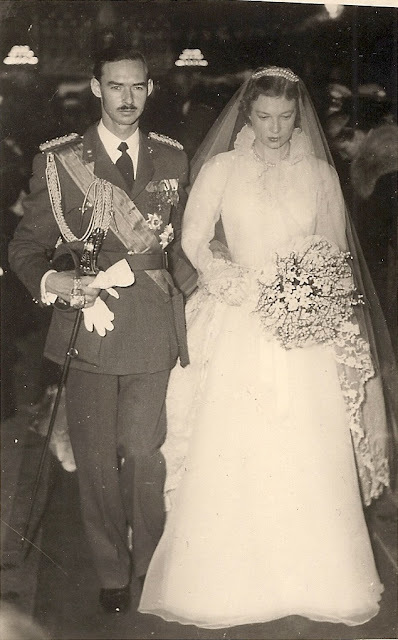 The lights were dimmed, as Prince Jean "slid a band of gold" on his bride's finger. 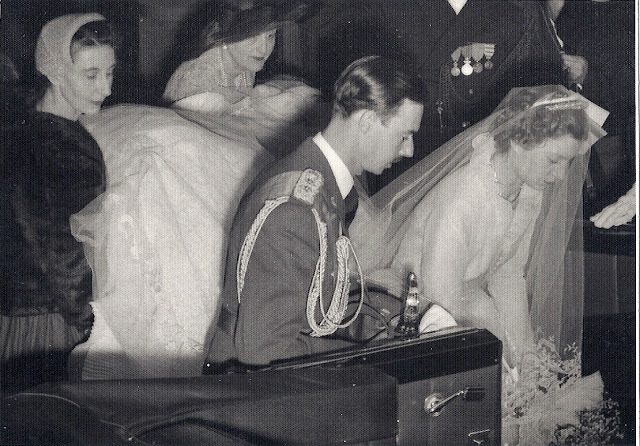 As the couple "marched down the aisle," Princess Josephine Charlotte "stumbled, paused, her eyes closes." Prince Jean "tightened his grip" on her arm. One guest, an unnamed Princess, became ill, and "had to stay in bed. The honeymoon destination remains a secret, but it is rumored that the newlyweds may spend some time in Africa or Brazil. They plan to be away for eight months as their new home, a chateau, is not ready for them. 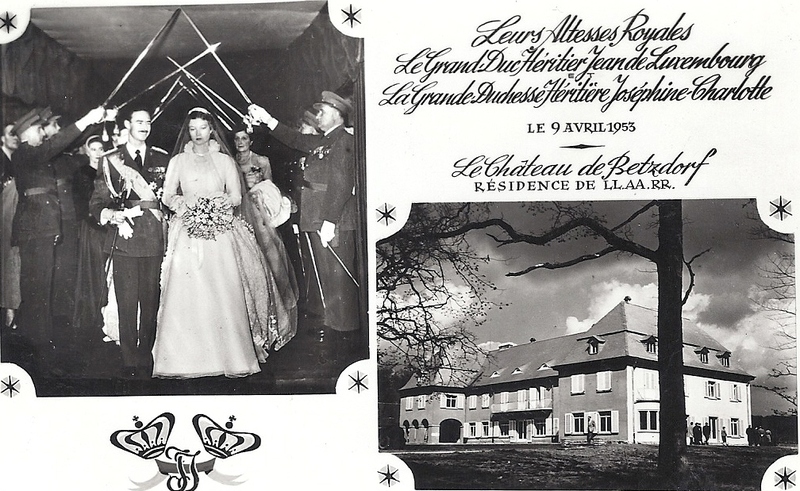 The chateau, which is about 15 miles from the capital, is "being transformed from a reformatory for young prostitutes" to a royal residence. Despite Josephine-Charlotte's problems at the wedding, the marriage seemed to be a peaceful one. I thought Jean and Josephine-Charlotte lived in Betzdorf Castle until he became Grand Duke? Did it serve as a reformatory for prostitutes? Yes, Schloss Betzdorf was a state run reformatory for prostitutes before it became a royal residence.